Each contadino has a piece of the wood allotted to him, and when the vintage is over, and the sowing of the grain and pressing of the olives not yet begun, the pinecones are gathered and stored. This raccolta is no easy matter, as the cones do not fall of themselves, but must be forcibly detached. One of the men mounts the tall bare trunk, on which the succession of knots and lopped branches forms a rude ladder, and at last sits perched, like some fantastic bird, high among the boughs. Then a perilous process to any but an agile and skilful climber he cuts the cones with a sharp knife attached to a long pole, and they fall to the ground, to be gathered by the rest of the family into heaps. Care must be taken, however, to keep at a safe distance while the actual rain of cones continues, as they fall with all the force of heavy stones, and a blow on the head would be enough to severely injure, if not kill, a man… The patriarchal fashion in which the contadini live, each family under its own capoccia or head, and the habit of taking the wives of sons into the house to share the work and submit to the domestic ruler, makes this arrangement of a double wedding necessary in most cases, as the sister’s departure makes room for the brother’s wife. Mafalda, arrived at the scene of action, set to work with praiseworthy energy, gathering pine-cones in her pinafore and depositing them on the heap which Dario and Giocondo and Fiore were dexterously transferring from the ground to the cart… ‘What they do with them, these pinecones, when they get them to house?’ ‘They put them in the fire, or in hot water,’ I explained, always glad to see Mafalda’s mind opening to instruction, ‘and the heat makes these little scales unfold, do you see, my sweet one? And below every scale lies a nut, warm and snug. Then the nuts are taken out and cracked, and are good to eat, and to cook, and for, oh! ever so many things, and the empty cones are sold for fuel, to make fires when the winter comes.’ Mafalda was deeply impressed by this information. 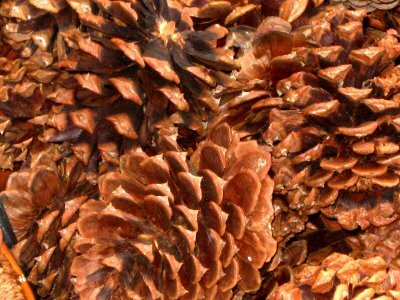 Her eyes opened to their widest extent; the mystery of the hidden nuts sleeping at the fragrant heart of the pine seemed to appeal to her, for she remained silent and nodded her head thoughtfully several times. ‘I take a cone to house, also I,’ she finally announced with determination; ‘and tonight we put her in the fire and take out her nuts, non e vero?’ Certainly we might do many things less amusing, so Mafalda selected a particularly noble and symmetrical specimen from among the piles before her, for the revels which we were to enjoy in that delightful hour which begins with the clearing away of the tea-cups, and is bounded so sadly and so soon for small people by the summons to bed. By this time the short November afternoon was drawing to a close; the day’s work was over, the last load was ready, and the cones piled so near to the level of the high waggon-sides, that it seemed as if no place would remain for us. Mafalda was much distressed. ‘Must we go on feet?’ she asked anxiously, using a form which, when one comes to think of it, is really more reasonable than our usual idiom, since no one person, much less two, could possibly return to the house on a single foot. However, her mind was set at rest by the courteous Dario, who scooped out a nest in the middle, lining it with sacks that we might not suffer too much from the hard and knobbly cones. We scrambled up, helped by the contadini, all of them loud in their injunctions to Fiore, who was to lead the oxen, to star’ attento and not jolt the signorine; then, with much pomp and circumstance, we set off, a proud procession, on the precipitous descent. The woods were dim and mysterious, grave with the quiet of evening, haunted by shadows and evasive presences which lurked among the trees; and it was pleasant in the misty grey of the twilight to picture the fire of blazing logs awaiting us, the welcome tea, and, beyond that agreeable horizon, the burning of the pinecones as a fitting conclusion to the day. Mafalda could scarcely eat her bread-and-jam in her impatience to begin operations, and no sooner was tea over than she committed her pine-cone to the flames. ‘May I sit upon it, the knee?’ she asked with her accustomed courtesy, after this important business was accomplished; and so we sat bunched up together in a great chair in the chimney-corner, and possessed our souls in patience while the glowing tongues of fire did their work. It was a real story-book scene: the warm glow from the logs flickered upon the tapestry and old portraits, and up to the vaulted roof of the salotto; the dogs lay basking in the warmth; the splash of the fountain in the garden, and the wail of the rising wind as it tossed a handful of dead leaves against the window-panes, only emphasised the cosiness within. It was a magical hour, made for musing and dreams; but Mafalda was in a garrulous mood, and too deeply concerned over the well-being of her precious pine-cone to watch it quietly on its glowing bed. ‘The pine-cone, she feel very hot,’ she pleaded presently. ‘If she not cool she burn me the hand!’ And as the cone really did seem to have opened its ‘petals’, I acceded to this request and removed it with the tongs to a corner of the stone hearth… The extraction of pinoli is one of the dirtiest occupations imaginable, the cones being sticky with resin, and blackened by flame; but Mafalda and I have no objection to ‘clean dirt’ in a good cause, and, as the former sapiently observed, ‘With the soap we can wash us the hands’; so by bedtime that is to say, the bedtime of well-regulated young people of six quite a large heap had been got out and cracked. Mafalda was charmed by the whole proceedings; but her pleasure reached its height when, very carefully, I opened one of the pinoli and showed her, in the safe sheath, trebly protected by nutshell and cone, the tiny waxen hand, with its slender fingers, which the country people call the ‘Manina di Gesu’. She went into ecstasies over ‘this little hand white’ and was not content until she had opened one for herself, a delicate operation, not easy for impatient, childish fingers to perform. At last Mafalda was led off’, reluctant, to bed; and ten minutes later I was leaning over her, and, obedient to her instruction, ‘more tuck’, straining the bedclothes to that unwrinkled smoothness which this exacting little person requires. Sitting up, she herself smooths away every crease from the tightly drawn sheet and counterpane, and then slides cautiously into a recumbent position, fearful of disturbing in the least degree the perfect neatness of her bed.